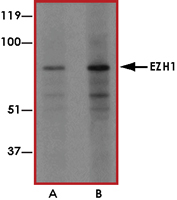 Sample Data :Western blot analysis of EZH1 in mouse lung tissue lysate with EZH1 antibody at (A) 1 and (B) 2 ug/mL. 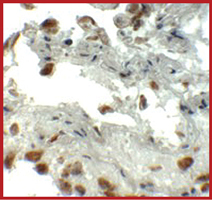 Sample Data :Immunohistochemistry of EZH1 in human lung tissue with EZH1 antibody at 5 ug/mL. 2. Margueron R et al: Ezh1 and Ezh2 maintain repressive chromatin through different mechanisms. Mol. Cell 2008; 32:503-18. 4. Ezhkova E et al: EZH1 and EZH2 cogovern histone H3K27 trimethylation and are essential for hair follicle homeostasis and wound repair. Genes Dev. 2011; 25:485-98.